How do you recognize the weak signals in your business? The story is often used as a metaphor for the inability or unwillingness of people to react to or be aware of threats that rise gradually. 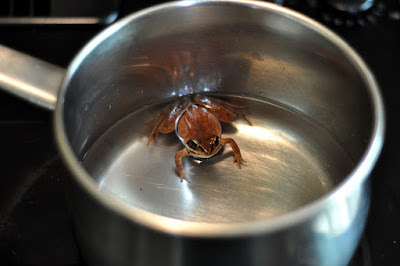 Sadly, when it comes to the customer experience, organizations are the boiling frog, frantically and reactively trying to get out of hot water with their customers. The key here is that they're being reactive. It's too late. The water is already boiling; they're about to be cooked. On the other hand, that slow boil, those threats that rise gradually? Those are also known as "weak signals." They are everywhere, and the trick is often knowing which ones to act on. It's important to be aware of them, to keep track of them, to understand them, and then to know when to act on them. Pay close attention to weak signals heard or seen about products, services, or markets that don't yet exist. (Have you ever said, "I wish someone made a product that did X?" or "Why can't this product do X?") The key here is that weak signals allow you to respond more proactively, rather than reactively. Where can weak signals be heard or seen? Many are found in the research you conduct every day, so you need to know how to spot them, but often they can be heard on social media or on other off-the-beaten path communication channels: snippets of information that provide some insight into where and how needs are shifting. You can also observe how customers are using your products or listen to their feedback. Which jobs are they trying to do or which problems are they trying to solve (that no one else is)? Have they started to hack your products to do something they weren't designed to do to begin with, simply to better meet their needs, more efficiently get the job done, or do something completely different? What are their painpoints with the way things are currently working or being done? These listening/observing efforts may likely be happening across your organization, but it would behoove you to find a way to pool or to centralize this work so that you're all on the same page. And then communicate! Share with the organization. The folks who need to act on this information? Make sure they're fully briefed and aware of the intel you've gathered. This reminds me of that post I wrote back in July about customer experience fueling innovation. Listen. Innovate. Or die. Beware. In today's fast-paced, technology-driven world, weak signals become strong signals fairly quickly. 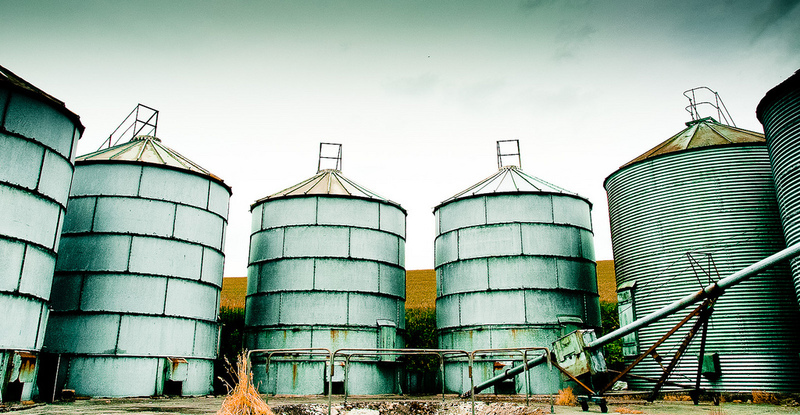 Is your organization suffering from silo-itis? If you answered that question with a "yes," you're absolutely, 110% not alone. Unless your company was intentionally built from the ground up to not function in silos - and you're lucky, and unique, if it was - then silos are an issue for you and for your customers. We all know how detrimental silos can be not only to the customer experience but also to an organization. When the organization is siloed, information is not shared, the cross/multi/omnichannel experience is a mess, and the organization as a whole is not really focused on the end game. Cross-functional collaboration and involvement is needed to execute on your customer experience strategy. Breaking down silos means that data and information flow freely across the organization, without any barriers. When those silos exist, a customer’s end-to-end experiences with the organization are fragmented and painful. I know that breaking down silos is a hard thing to do, especially in large organizations. And some would argue that silos are a good thing; in some contexts, that is true, but not when it comes to executing a seamless customer experience. These silos perpetuate or become the root cause of data silos, systems silos, metrics silos, and more. NewVoiceMedia proposed some solutions for breaking down the silos, including hiring a Chief Customer Officer (CCO), who will lead and oversee customer experience efforts across departments, business units, and the entire company. She will champion the voice of the customer throughout the organization, ensure that there is a focus on the customer, get departments and business units speaking and sharing information openly, and create an environment that encourages collaboration, teamwork, trust, open communication, and a "one company" approach. A lofty goal, no doubt. Governance structure. Without a governance structure in place, we perpetuate silo thinking and fail to achieve cross-functional alignment, involvement, and commitment. A governance structure outlines people, roles, and responsibilities associated with your customer experience strategy. Who is going to ensure that there is alignment and accountability across the organization? Guiding principles. This might seem like a weird one; the other two are very tangible tools, and this one seems a bit softer. Guiding principles unite the organization in a different way: they are beliefs or philosophies that guide the organization through everything it does; they help employees understand what's right and what's wrong; they outline how employees are expected to act and behave; and they help employees make decisions and do the right thing. Some silos are good; many are not. But the key here is really getting everyone to work together - sharing, collaborating - for a common purpose, a common goal. I don't really have to tell you what that purpose is, do I? How do you identify and prioritize improvements within your organization? Last week, I wrote about the 5 Whys method, which is used to dig down to the root cause of problems experienced within your organization or by your customers. Recall that this method is about asking "Why?" five times to drill down to the ultimate cause. You can adapt this process to your needs; sometimes asking "Why?" five times is too many, and sometimes you need to ask it more than five times. Once you've determined the root cause, the next step is to identify how you're going to fix that so that it never happens again. Some people recommend coming up with five "hows" or five solutions. Once you've got a set of viable solution options, you'll need to narrow that down to your next best action. And yes, there's a "5" for that, as well: the Morris 5 So Whats. 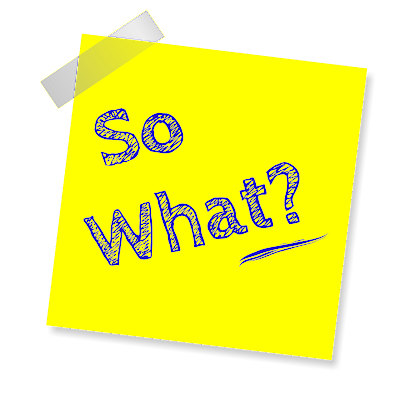 The 5 So What approach goes beyond the 5 Whys. It challenges advocates of improvements and solutions to answer the question “So what?” By the time practitioners ask and answer “So what?” five times in response to the impact of a potential solution, they will reach a maximum impact. (In some cases it may take even fewer questions.) The impact of different solutions can then be weighed against each other to assist in prioritizing the implementation of solutions that best support organizational goals or customer requirements. The 5 So Whats methodology was developed by the U.S. Army to move beyond uncovering root causes to actually implementing ideal, impactful improvements. The approach: after you've determined the root cause, ask "So what?" five times (or as many times as you need) in order to determine the optimal solution. When you conduct a So What exercise, you're really trying to understand the importance and the impact of implementing a solution. Consider financial impact, outcomes impact, customer impact, employee impact, environmental impact, efficiency impact, etc. There are probably other impacts to consider, but once you look at the various impacts side by side, you can create some sort of feasibility rating that then allows you to prioritize improvement opportunities. To me, it seems like a smart exercise to do with any improvements that you plan to make. So what? Who does it impact? What does it mean for each stakeholder? How does it impact each one? What does it mean for the business? I originally wrote today's post for TandemSeven. It appeared on their blog on January 7, 2016. Fact: Without your employees, you have no customer experience. The linkage between employee experience and customer experience has been proven. It's real, and your employees matter. What is the employee experience? It's the sum of all interactions that an employee has with his employer during the duration of his employment relationship. So how do we ensure that our employees are happy, engaged, and having a great experience? We ask them. We listen to them. We find out what's going well and what's not. 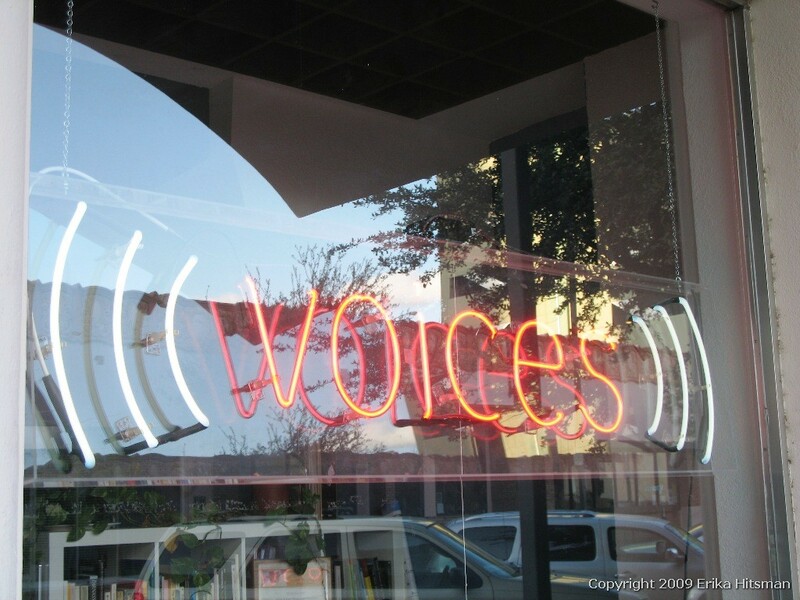 When you implement a formal program to listen to employees, the initiative is referred to as Voice of the Employee (VoE). In this blog, I’ll describe the context that a Voice of Employee program needs to thrive, effective employee listening methods, and how you can actually use those insights. Companies listen to customers to understand them and their experience, but at the root of the customer experience is the employee experience. If employees aren't happy, engaged, and equipped with the right tools and resources to do their jobs, then the customer suffers. Think about your interactions with companies like Southwest Airlines, Zappos, or Ritz-Carlton; these companies have created intentional cultures of employee experience, happiness, and engagement first because they know that if their employees are miserable, their customers will be, too. So it's important that we listen to employees and find out what's keeping them from being able to delight customers. Voice of the Employee programs consist of many different types of listening posts, including: employee engagement surveys, employee satisfaction surveys, culture assessments, transactional/event-based surveys (e.g., onboarding), exit surveys, stay interviews, 360 feedback loops, social media (e.g., Chatter, Yammer, or other internal social tools), suggestion boxes, and more. Through listening and then through proper analysis, you can identify those factors that inhibit employees from doing the job they were hired to do and from delivering a great customer experience. Those inhibitors could include lack of coaching or training, inadequate or inappropriate tools and resources, and other barriers or frustrations that cause the employee to work inefficiently and ineffectively. When the effort employees put forth to do some task outweighs the benefit of completing said task, that's problematic. For you and for the customer. Journey mapping creates awareness for the steps that an employee takes to do whatever it is that he's trying to do within the organization. Take a look at major tasks that you want to map, conduct mapping workshops, talk to employees about the steps they go through to do each task, and identify key moments of truth. Maps also identify areas where things are going well (or not) and where you'll need to get more feedback from employees. Maps really bring the employee experience to life, allowing company leadership to understand what employees are going through as they complete some task. I conducted an employee journey mapping workshop for a small retailer. The CEO and a few other executives sat in and listened for about an hour; they were curious what it was all about. I'm glad they stayed as long as they did. They were shocked to learn at how difficult they'd made it for their employees to do even some of the simplest tasks; they realized that even those simple tasks inhibited employees from being able to deliver a great customer experience, never mind the fact that they frustrated employees to the point of wanting to leave. Maps also create the empathy that is equally important to creating a great employee experience as it is to creating a great customer experience. Maps will facilitate a culture transformation - to one that's more employee-centric and customer-centric. There are a lot of ways to listen to employees, as I noted above. Each one has its purpose, but, ultimately, all of them are designed to ensure that the employee experience is optimal. Use what you learned during the journey mapping exercise to ensure you're asking about the experience during the most important interactions, specifically the interactions that matter most to your employees. Make sure you're asking the right questions so that you have the level of detail and actionability that you'll need to improve the experience. You'll be listening to employees at various touchpoints and across the employee relationship overall. You'll need to put all of the feedback together and understand the experience along the employee experience journey and across the entire relationship. It's important to understand not only how well the experience is at certain points in time, in the relationship, but also the big picture and how it all fits together. The most important thing when you capture their feedback is that you must act on it - you must do something with it. Nothing frustrates employees more than when they tell their managers that something is wrong or when they spend time to complete surveys - and then management doesn't listen and doesn't act on what they've been told. There's a lot to do, and you'll likely need some tools to help you get it all done and to help you build in a continuous improvement loop. Having one platform where you can bring all of your data and artifacts into one place so that they can be tracked, shared, and measured is ideal. If you're not sure how to get started or what to do, you may need to enlist the help of a consultant, who can guide you through defining your strategy, mapping the journeys, listening to employees, analyzing the findings, and putting it all to work. The consultant can also assist you in identifying and implementing the appropriate tools to facilitate improving the employee experience. No one can argue with those outcomes! Never forget that people buy from people. That's a great reminder of why listening to employees and improving the employee experience are a priority in your organization. Have problems? How are you solving them so that they never happen again? How are you getting at the root cause of any issues you or your customers are having? What types of root cause analyses (RCA) are you conducting? Or are you even thinking about RCA? Conducting some sort of root cause analysis (and there are many different types) any time you experience an issue is critical, for the simple fact that you want to nip the issue in the bud and not have it occur again. Too many companies fix the symptoms and call it a day, only for the issue to occur over and over again. When you fix the symptoms, you're applying bandages rather than curing the disease. Getting at the root cause and fixing that ensures the same issue won't recur. One of my favorite RCA methods is the 5 Whys. I like it for its simplicity. Whether that's a good thing or not, I don't know, but I do know that that simplicity allows people to really understand what it means to get to the root of the matter. It also helps you understand the relationship between different (root) causes. It's a great tool to help you understand. Simple, quick and dirty, but powerful. 5 Whys is an iterative interrogative technique used to explore the cause-and-effect relationships underlying a particular problem. The primary goal of the technique is to determine the root cause of a defect or problem by repeating the question "Why?" Each question forms the basis of the next question. The "5" in the name derives from an anecdotal observation on the number of iterations needed to resolve the problem. This method was developed by Sakichi Toyoda; it was adopted throughout Toyota Motor Corporation for a variety of uses, but specifically used during the development and evolution of its manufacturing methodologies. As noted, simply state the problem, and then ask "Why?" five times to drill down to the ultimate cause. You can adapt this process to your needs; sometimes asking "Why?" five times is too many, and sometimes you need to ask it more than five times. One of the problems with the 5 Whys to be aware of is that different people may come up with different root causes. I recently saw a post by Pete Abilla about his experience at Amazon, when Jeff Bezos conducted an impromptu 5 Whys session to understand why an employee hurt himself. I came up with a different root cause, as I followed along. (I inserted the question, "Why did the conveyor turn on by surprise?" That took me down a different path.) So be aware of that. Having cross-functional representation in the 5 Whys session will be helpful, especially if your scope of knowledge limits your ability to go further/deeper into the analysis. I think it's OK to come up with different root causes; it drives further discussion and investigation to get to the real root of the matter. In my mind, it's possible that there are a couple things that need to be fixed, not just one. You need to understand the impact of each and prioritize improvements accordingly. As the Wikipedia post suggests, it might be a good idea to have some test of necessity and sufficiency at each level of analysis. 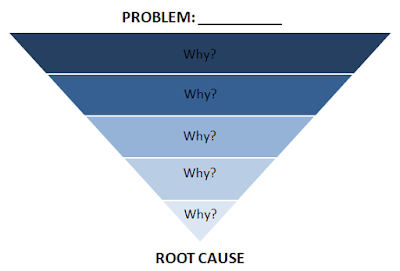 For more details - and to ensure that you move the organization from fixing symptoms to fixing the root cause - Eric Ries writes a great post on how to conduct a 5 Whys root cause analysis. What is Your Company Doing to Celebrate Its #CX Professionals? How will you and your company be celebrating CX Day this year? CX Day is a celebration of customer experience professionals, those folks who work tirelessly to design and deliver a great customer experience to their customers. This day is meant to not only highlight the profession but also to continue to raise awareness of the importance of the customer experience. CX Day is the brainchild of the Customer Experience Professionals Association (CXPA), the international non-profit organization created to guide and enhance the growing field of customer experience management. It occurs on the first Tuesday of October every year; however, this year, it's been shifted to Wednesday because of the Jewish New Year. CX Day started in 2013, having received Congressional recognition that year, and we're excited to continue the celebrations for the fourth time this year. What happens on CX Day? A lot! Here's just a brief snippet of what's to come on October 5. Many of these are still in the works, so details are not yet posted on the CX Day site, but check back frequently for updates. If you need resources to plan your day or to spread the word, the site offers those. And if you'd like to sponsor CX Day, there are still sponsorship opportunities available. CXPA is five years old this year, and I can tell you there are a lot of great things to come in the future with the Association. I've been an active member of CXPA almost since day one. I'm an executive officer on the Board of Directors. I'm one of the team leads for SoCal CXPA Local Networking Events. I've been involved with planning the Insight Exchange for the last few years, co-hosted this year's Insight Exchange, and will co-host next year's, as well. I'm a CCXP, a CX Expert, and a Mentor. I've been involved with planning CX Day since 2013 and have been actively engaged in both online and offline events for it every year. And much, much more. So you can see, as a customer experience professional, you have a lot of opportunities to volunteer within the Association to help spread the word about what we do and to get involved in planning events, learning from and sharing with other members, and more. Get started planning your CX Day celebrations now. And if you haven't joined the CXPA yet, take time to check out the benefits of membership, and definitely talk to other members about it. It's great to be a part of a community that loves to share and that embraces the challenges others are having as their own - mainly because we are all having those same challenges!